Our dietary supplement Marine Collagen has been created to provide a beneficial source of natural collagen. Collagen is known for the key role it plays in joint and skin health. It exists in several forms in the body including type 1 collagen which is found abundantly in connective tissue and skin. Our supplement Marine Collagen has been developed to provide this specific form from a natural source. It contains patented, hydrolysed, marine collagen which has been purified and concentrated to produce a high quality supplement. Collagen plays a key role in the body’s structure. Accounting for almost 80% of the weight of connective tissue, it is found in the extracellular matrix, a kind of ‘cement’ between cells. As part of this structure, collagen contributes to the mechanical resistance of tissues, and is particularly important for ensuring their resistance to stretching. An essential element of the body’s structure and vital for maintaining many of its tissues, this molecule ensures good cohesion between cells and tissues. It is also involved in cell regeneration. Collagen is, in fact, a family of molecules rather than a single molecule; there are actually over a dozen types of collagen in the body with varying structures. Although collagen is formed by three polypeptide chains, these can be combined in several ways and by several types of bond. Each form of collagen may have a different site and action within the body. The most abundant is type 1 collagen, found in many tissues such as the skin, bones, tendons, cornea and internal organs. That is why our Marine Collagen supplement has been formulated to offer type 1 collagen. Although collagen can be secreted by cells in connective tissue, production tends to decline with age. According to some scientists, collagen synthesis falls by around 1.5% each year, starting at the age of 25. As a result, levels may have declined by up to 30% by the age of 45. Decreasing collagen levels have a significant effect on the quality of our skin and the health of our joints, and topping up our collagen may therefore be necessary to restore healthy levels and prevent the development of problems. Supplementation is all the more important since we cannot obtain collagen from our daily diet. a therapeutic effect in the management of health problems such as arthritis, psoriasis, physical injury, and even certain cancers. 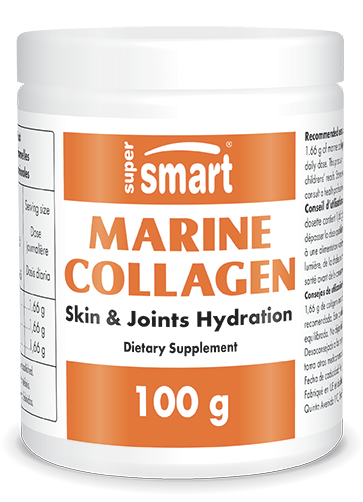 Our Marine Collagen supplement helps counteract the decline in collagen production to improve skin and joint health. It has been formulated from natural-source, powdered collagen, developed from a hydrolysate of purified fish collagen. This natural form also provides glycine, proline and hydroxyproline – the three main amino acids in the skin. For maximum ease of use, this supplement is produced in the form of dosettes, one to be taken each day, diluted in a glass of water. Other innovative formulations aimed at combatting ageing of tissues such as the skin include Natural Skin Formula and Injuv® Hyaluronic Acid.